When it comes to data storage solutions for a PC, there are three main kinds of hard drives, SATA, solid state drives, and hard disk drives. Hard drives are basically metal plates with a magnetic surface that store the bulk of your data. Your resume, pictures of your dog, and your favorite recipes are all stored there, assuming you haven’t put them in the cloud. Here we will examine the differences between SATA, SSD, and HDD drives. Hard disk drives (HDD) are the original hard drives. HDDs use a read/write arm on top of a spinning disc. The whole device kind of resembles a tiny, shiny vinyl record player. These drives are large, bulky, and prone to problems. One of the most hassling problems of hard disk drives is that they tend to get “fragmented” with time. This occurs as a result of the disc becoming crowded with data that was not written on the drive sequentially. When large files are being written to a new drive, they fit nicely into the storage space. But as time goes on, and lots of files of varying sizes become written to the disk, they don’t all fit together nicely. HDDs can still access files that are not all written in one place. It just takes more time as the drive has to spin for a little while longer. That’s why hard disk drives need to be “de-fragmented” or “de-fragged” from time to time. Files have to be sorted back together in an orderly fashion, not unlike an actual, physical filing cabinet. Solid-state drives (SSD), by comparison, do not have this problem. SSDs store memory in flash drive where it can be easily accessed. It’s almost like random access memory (RAM) that doesn’t delete itself when the device powers off. It’s revolutionary in that for the first time, hard disk storage can now be lightning fast while fitting onto an even smaller device. That’s why laptops have gotten so much smaller and lighter in recent years. There’s no longer any need for the bulky hard disks that once resembled cross-cut sections of a cinderblock. The third option for hard drives is a SATA drive. SATA drives are less expensive and more common than SSDs. However, SATA drives are also slower to boot up and slower in retrieving data than SSDs. If you’re looking for a hard drive with tons of storage space, a SATA drive may be for you, as they commonly hold terabytes of data. But take note of the fact that because SATA drives have moving parts, they are more likely to malfunction. HDDs are similar to SATA drives in terms of the functionality. 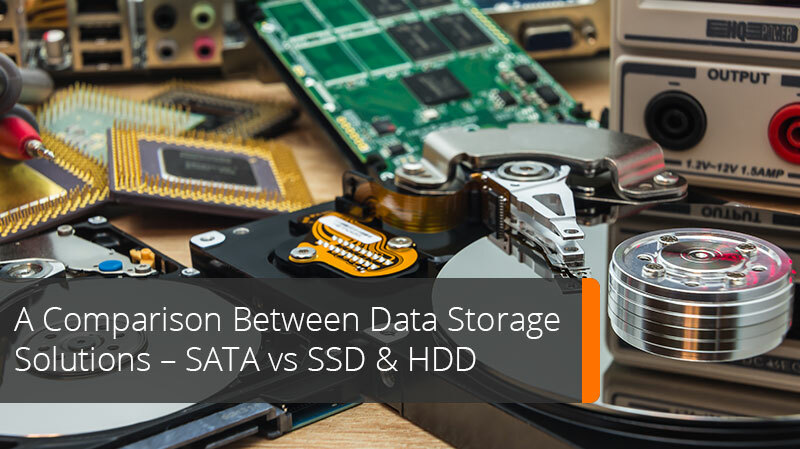 Comparing SSDs to HDDs is similar to comparing SATAs to SSDs. Let’s look at the differences in terms of reliability, speed, and lifespan. SSDs are more reliable than HDDs. Because SSDs don’t have moving parts (hence the term, “solid state”), there’s a lot less that can go wrong in terms of malfunctioning. And while the lifespan might generally be shorter than an HDD, solid-state drives win the battle of SSD vs HDD reliability hands down. Without question, SSD drives are faster. Files can be written and read without the need for a spinning disc. It’s like the difference between a two-wheeled scooter that you have to push and one with an electric motor. There’s not much more to be said about SSD vs HDD speed. Systems using SSD drives feel snappier due to their ability to quickly retrieve files. HDDs just don’t work the same way. By now, you may be thinking that SSDs are far superior to other types of hard drives. And in the short term, this may be true. But when it comes to SSD vs HDD lifespan, another picture arises. SSDs work by forcing electrons through a gate in order to change their state. This creates wear and tear on the cell, gradually reducing its performance until the drive gives out. So, while HDDs become bogged down with heavy storage and need to be defragmented, they tend to last longer if you plan on using the same hardware for a number of years. Which solution is right for my needs? All in all, HP hard drives, HP SSDs, and HP SATA drives are all quality pieces of hardware. HP is one of the most recognizable names in tech hardware, and provides solutions for a variety of industries, including government offices. The best option for your needs depends on what you need to get out of your drive. HDDs are the best options for large amounts of storage with a greater lifespan, while SSDs offer greater flexibility and speed. Most users opt to have both options for their work station by storing files that they’ll need for years on a HDD, and using SSDs for files that have to move between devices. ABM Federal has a broad selection of IT hardware, including SSD hard drives and SATA hard drives. Contact us today. © 2018 ABM Federal. All Rights Reserved. Have a question? Need additional information? Call us at 800.522.9226, email sales@abmfederal.com or click on the "Contact Us" button below. Copyright © 2019, ABM Federal Sales, Inc.